With the Dow Jones Industrial Average climbing above 25,000, it's hard to know if we're looking at a market top. Stock prices could still sink lower if more tariffs are introduced and the United States finds itself in a global trade war. 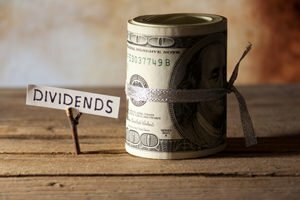 But if you want to make consistent income even during times of uncertainty, it's still possible through dividends. We are always looking for companies with strong cash flow. These are the performers who consistently pay their investors each quarter and ensure solid returns. Delta Air Lines Inc. (NYSE: DAL) will increase its quarterly dividend from $0.305 per share to $0.35 per share for a 15% jump. Rising fuel costs and fears of travel restrictions have sent the DAL stock price down 5.91% over the last 12 months. However, analysts project that the price of DAL will climb 34.16% over the next 12 months, from $50.90 per share to $68.29 per share. KeyCorp (NYSE: KEY), the parent company of KeyBank, announced that it will hike its dividend by a whopping 42%. The announcement – a hike from $0.12 to $0.17 – is further proof that U.S. banks are much healthier. KEY also just hit the "Buy Zone" on the Money Morning Stock VQScore™ system. Finally, J.M. Smucker Co. (NYSE: SJM) has hiked its dividend from $0.78 to $0.85 per share. That's a 9% bump and represents the 17th year in a row that the company has hiked its dividend. The company is also starting to look like a potential takeover target for firms like Kraft-Heinz Co. (NYSE: KHC). SJM is also in our "Buy Zone." Apple Inc. (Nasdaq: AAPL) is one of our favorite stocks at Money Morning. It pays a dividend of $2.92 (yield 1.57%), and it's about to win the race to $1 trillion. Here's everything you need to know. Sometimes the hidden gems in the stock market are the ones right in front of you. These companies make products you simply can't live without. Their products likely fill your drawers and cupboards. Incredibly, one company has products in 93% of U.S. homes. Take a look and see why it's time to put your investment money where your shopping dollars go. After years of bull market infatuation and astronomical price gains in leading stocks, investors are now turning back toward dividend stocks. But you don't have to pick either high-growth stocks or dividend stocks. You can have both, which is why we're bringing you five high-yield tech dividend stocks today.